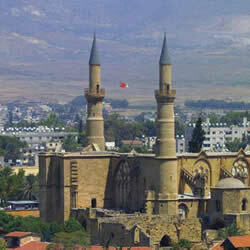 Nicosia City also known as Lefkosa is another excellent place to visit during your stay in North Cyprus. This city is undergoing some dramatic changes and a visit is something that you really must do. Nicosia is the capital city of North Cyprus and also South Cyprus. The border between the two countries can be found running right through the middle of the old city in a west to east direction. During the Venetian times large stone walls were built around Nicosia to protect the city from Ottoman invaders. The current border as it stands today looks rather dismal in comparison to these stone walls but it is protected by barbed wire which is referred to as the Green Line and is the main symbol of the divisions that lie between the north and south of this island. In 1979 the master plan for Nicosia began even though work really only started in 2001. This UN sponsored plan is to help restore all the important areas that are located in both North and South Nicosia. North Nicosia is now emerging from years of being covered in scaffolding. The results are magnificent and you will now find some amazing architecture and some ancients buildings too. The gothic churches have been preserved and their towers have been augmented. Inns are once again opening their gates to welcome visitors. Once for wealthy merchants these inns have now been restored and reopened as centres for all the local artists. The colonial houses that once stood have been redeveloped and are now being used for commercial offices and fine restaurants. Best of all, the dry moat that was located outside the cities walls has been transformed into parks for all citizens to enjoy. This historic walled city is a wonderful place to shop and eat and no holiday to North Cyprus would be complete without a visit. Be sure to bring your rental car if you plan on shopping though as you may find it very hard to get home with all those bags otherwise. The major commercial centre of this city is located outside the walls but once you wander into the old city you will find bazaars and markets where you will find everything you could need. There is food, clothes, and numerous souvenirs for you to choose from. Restaurants here have everything you could possibly eat from traditional meze to local beers and wines. Nicosia also has traditional bath houses where you can relax and take a break after your day of shopping. There are not that many hotels in North Nicosia at present but this will probably change as time goes on. Most holiday makers that arrive in North Cyprus choose to stay in Kyrenia or Famagusta but a day or night trip here is definitely one that will be memorable. At night time the city comes alive and if you have a rental car you really must be sure to see this. Bus services don’t run at night time in North Cyprus so a rental car or taxi is the only way to see this fantastic city come to life at night. Book your car and get on the border!